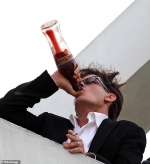 His struggle with alcohol and drug addiction has been well documented. And Charlie Sheen reflected on his public battle as he appeared on Thursday's episode of Loose Women. Revealing he has now graduated from rehab, the 53-year-old actor spoke candidly about how being unable to care for his daughter inspired him to go sober, and that he would often feel 'possessed by a demon' when he wanted a drink.